From business perspective the key is to offer trend accurate choice architecture, to provide enough variation to the product so that there is something for everyone’s taste and wallet. The jewelry and watch industry principles apply from wearables to smart devices – personalization and beauty are everything. 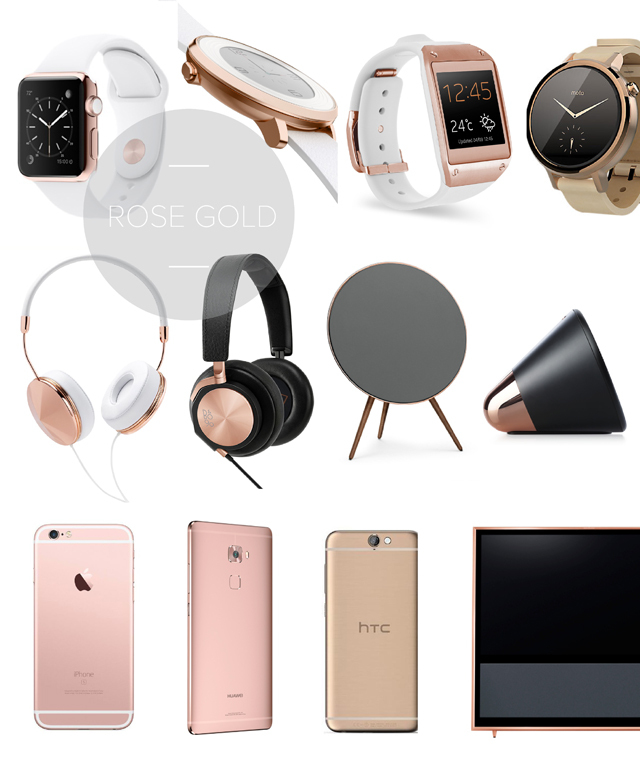 Looking into the consumer electronics the rose gold is emerging: Bang & Olufsen launched rose gold Love Affair collection to celebrate their 90th anniversary. Smart watch category latest launch of Pebble smart watch introduced beautiful rose gold case. The Pebble CMF was designed by Reiko Morrison. Pebble has the thinnest watch case in the market, with longest battery life due to the e-ink display making it the most competitive smart watch from our perspective. Smart phone category Apple iPhone 6s rose gold is said to represent as much as 40% of preorders. Rose gold model was especially created for the Chinese consumer in mind, according to Apple’s CEO Tim Cook. HTC One a9 leaked images follows the rose gold path laid by Apple and Huawei, though the product rendering is a bit too much towards champagne but naming is rose gold. ‘As something becomes embedded in lifestyle and as it starts to become commoditized, people look toward more superficial design things to differentiate. And colors are the classic. If you do it at the right time, it will create a significant increase in sales every time.’ Robert Brunner, Ammunition.